Billy Braungart and Joe Pizzoferrato). 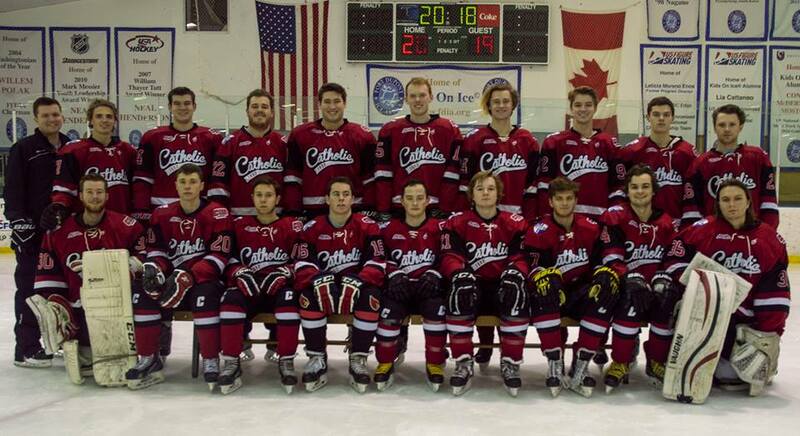 Courtesy of CUA Ice Hockey. The Catholic University Men’s Hockey Team played their final home game of the season this past Friday in what would become a very lopsided 11-1 victory against Wagner College. For seniors Billy Braungart, Tommy Shaw, Vaughn Smith, and Stephen Terenzio, it was the final time that any of them would play a home game for the Cardinals. The team held a short pre-game ceremony where the seniors took flowers to their families one-by-one while the rest of them team tapped their sticks in appreciation. The crowd took it one step further, drowning out the Fort DuPont Ice Arena with cheers for their seniors for the full 60 minutes of play in what was probably the most attended game of the season. Vaughn Smith has a personality like no other person on the team. He has a great sense of humor and has a knack for breaking the tension in the room. Even though he is an easy going person, he is a great player and is always looking to get into the mix with someone on the ice. Vaughn has kept me on my toes for the past four season, but makes it extremely difficult to stay mad at. Vaughn personality and skill will be seriously missed by not only the team, but by me. One of the many memories and something I’ll miss from Vaughn, is anytime he gets hit by a team mate or a puck at practice to be over dramatic with his reaction. Though it drives me crazy, it’s always nice to have a laugh during a stressful practice. Tommy Shaw is the epitome of a player with all heart. Tommy showed up halfway through last season had only ever played street hockey and ice skated a handful of times. With a short impromptu skating lesson in the morning, Tommy took to the ice that night in goalie pads to face against Shippensburg University. With Tommy’s competitive nature and not wanting to let his new teammate down, the team won their first game of the season 7-6. Tommy has done nothing but working tirelessly to become better and compete for his spot in the net. A little over a year later, he posts a 11-1 win after facing 30+ shots. Tommy is a modest and extremely humble person who would happily give you the shirt off of his back. And even though he is aware of his ability, that will never stop him from striving to be the best. Billy Braungart is whom I’ve always referred to as my security blanket. Billy has a strong hockey experience background and is a great asset for our team. Billy is a big, strong, physical defenseman who can skate well with or without the puck, shoot and play his position well. It will be a huge hole to fill after this season. He’s one of those players that when on the ice, it’s one less thing to worry about as a coach. I will certainly miss Billy’s presence on the bench and in the locker room. One memory I have of Billy is when he was asked to be on college hockey player podium at the Washington Capitals’ high school showcase. He has the opportunity to share his experience and knowledge with high school students about his college life. Stephen Terenzio can only be described as Stephen Terenzio. Stephen has been a pivotal piece to our program over the last four years. Not only for what he does on the ice, but the amount of hours he puts in for the team off the ice. Stephen was our Vice President and Treasurer as a Junior and has been a great fit as our President as a Senior. Over the past four years I’ve watched Stephen grow into a strong and consistent defenseman on the ice and a leader on our team. It will be extremely difficult to fill Stephen’s shoes. There have been way too memories to list with Stephen, but the one that sticks out the most is when we played Rutgers this year. With us being down the whole game and being outplayed, Stephen carried the puck across the blue line and blasted one in to tie the game. The reaction from him and the bench was like none I’ve seen with this team. The emotion and rush from this moment is one I’ll always remember with this program. Each of the seniors has their own personal favorite memory from Catholic hockey that they will look on fondly in the years to come.